The multi-touch table display allows multiple users to interact with digital information, grabbing and moving virtual objects with gestures and touches. Play and learning go hand-in-hand. Young visitors explore gravity in the Giant Worlds exhibit. A workshop participant and students discuss a science project. Saving Earth from a giant asteroid impact is hard work but someone has to do it. Visitors at the Great Balls of Fire exhibit. Classroom teachers learn inquiry-based approaches that they can share with their students. Middle school students learn about the solar system through kinesthetic activities. Children explore the skeletal system with a matching game. NCIL staff and our partners have developed a number of education activities and resources for classroom teachers and museum educators. They include stand-alone curricular supplements, educational websites (e.g. 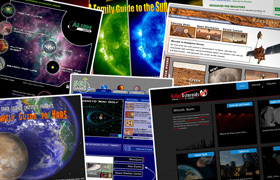 SciGames.org, Giant Worlds, Space Weather Center), education videos on a variety of science topics, and resources for scientists interested in developing effective education programs. Explore and Discover! NCIL projects are designed to be accessible to all and to inspire the next generation of STEM innovators. 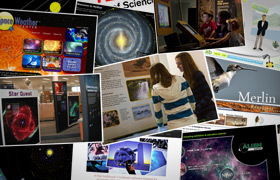 These include traveling museum exhibitions, digital learning technologies, educator workshops, outreach to underserved audiences, and successful partnership building between scientists and educators. We also conduct all areas of evaluation including audience research, front-end, formative research, process and implementation evaluation, and summative evaluation.